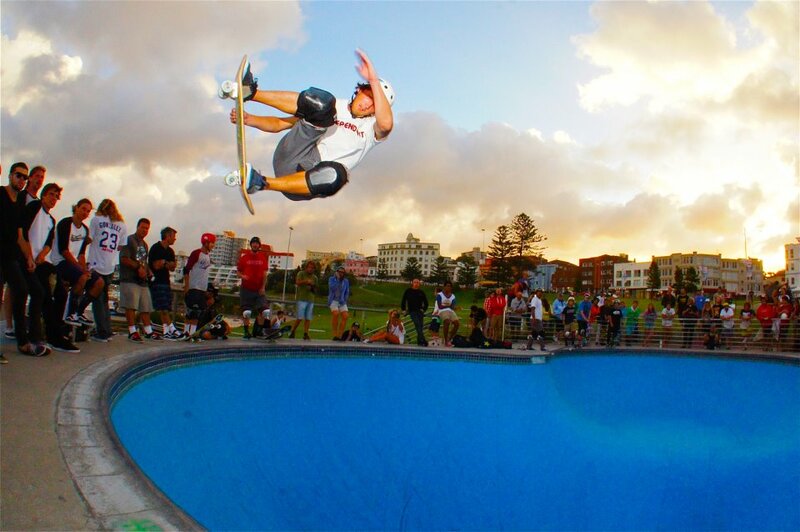 Day #2 of Bondi Bowl A Rama brought good and bad news. Good news because Cab was able to enjoy his party. He his celebrating 20 years of a skateboard shoe: the Half Cab. Vans will actually celebrate the half-cab all year so if you missed the party in Sydney, there will be others coming up. In this video on the left, you can see the action from the bowl, the international team riders at the Galeries store signing and the epic Half Cab Party. The bad news is coming from the actual bowl. Some heavy S- - T went down last night in Bondi last night. Some rumors are pointing to an either disgruttled punter / photographer or just some low life scum who wanted to ruin the event... Unconfirmed but sources at the bowl believe either paint stripper or some old engine oil was poored all around the bowl last night whilst the Bowl-A-Rama Opening Party was being hosted at White Revolver... Today the bowl had to be re-sand blasted and re-painted which this process took well into the afternoon. Nige was over there before me and was disgusted, along with all the riders who were ready to skate all day. The repaint job went well into the arvo and skating was off limits for pretty much all day. Anyways, the Bowl A Rama 2012 saw a Massive Day Two. Thanks to Kim Andison for the coverage and Dan Sparagna-WCS for the picture. All pictures used with permission. Man, what kind of idiot is capable of doing something like that? He should be sandblasted too.